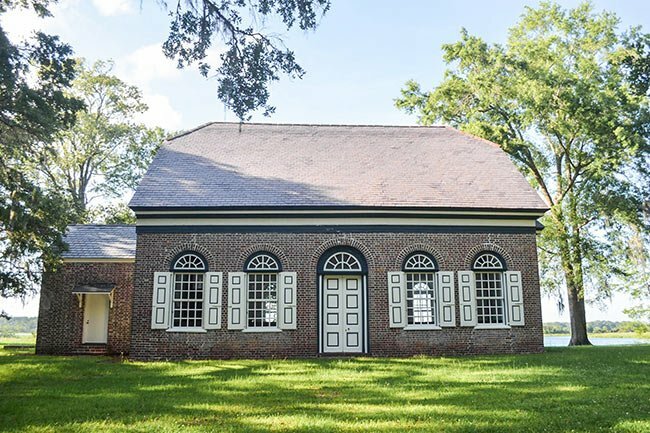 Constructed between 1763 and 1765, Pompion Hill is located near Huger in Berkeley County, where it once served as the official chapel-of-ease for the St. Thomas Parish. 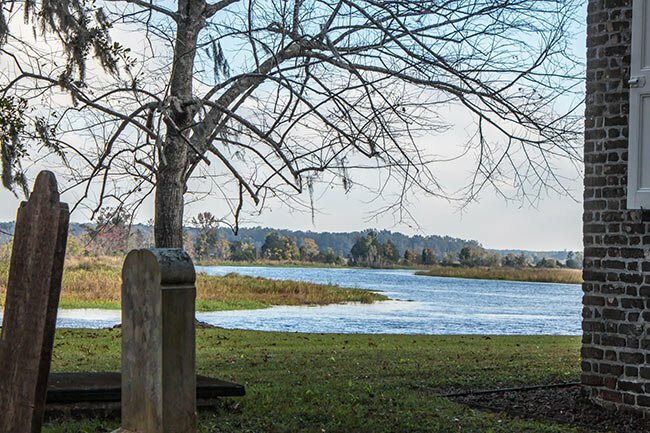 It sits on a small bluff overlooking the Cooper River. 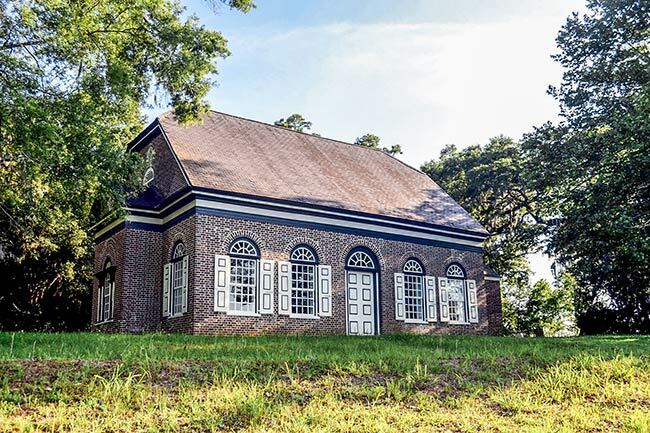 The Pompion Hill Chapel, considered a “miniature Georgian masterpiece,” replaced a wooden sanctuary built in 1703. 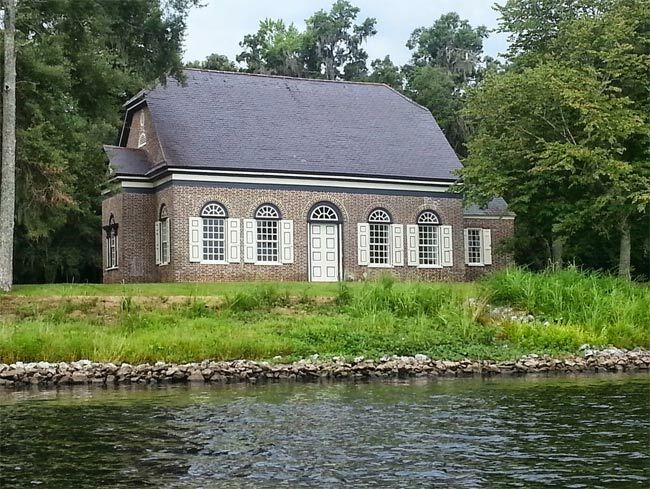 That chapel originally served French Huguenots who had settled in the area in the late seventeenth century. The congregation began worshiping in the Anglican tradition shortly thereafter, due in part to the Church Act of 1706. 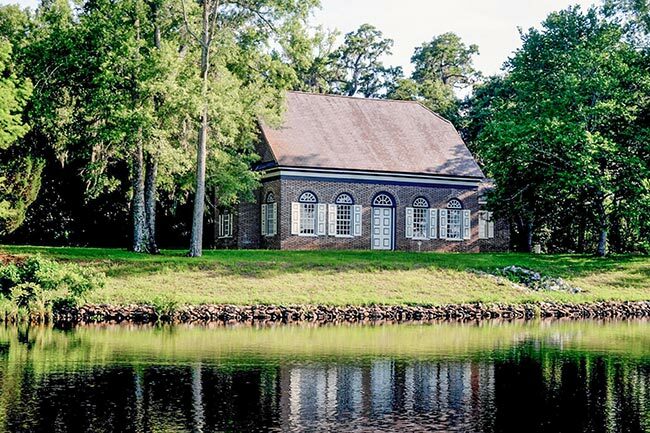 The Church Act of 1706 designated the Church of England as the official church of the Carolinas. Congregations belonging to other denominations could worship in their own faith, but members of these non-Anglican churches – known as “dissenters” – could not hold public office, nor did their churches receive public support. 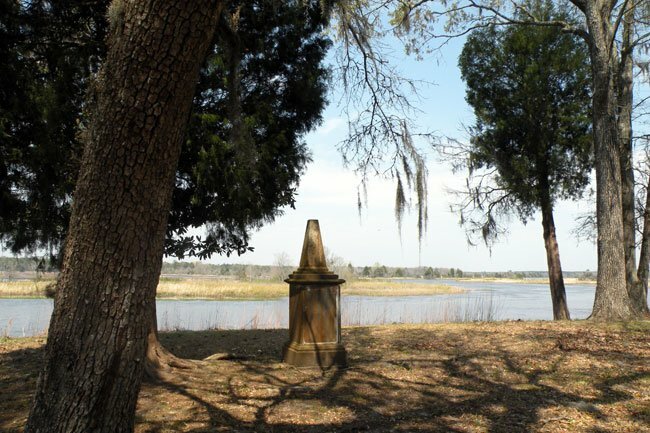 The Reverend Thomas Hasell, an Anglican priest who owned nearby Pompion Hill Plantation, arrived to Berkeley County from England in 1709 to lead the church. The Church Act was abolished after the Revolutionary War. Interestingly, the name of this church is sometimes pronounced “Punkin’,” even today. 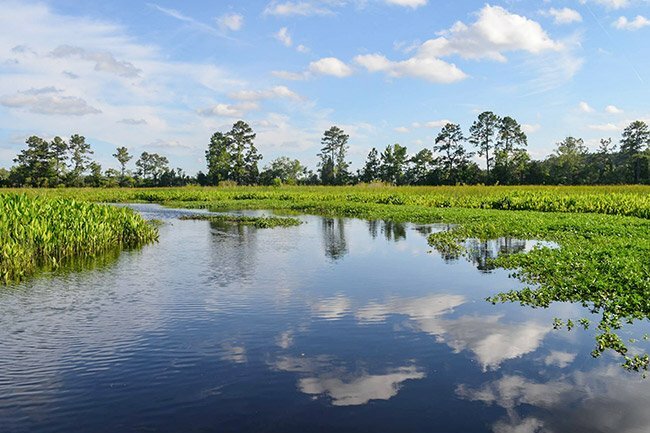 As previously mentioned, Berkeley County was settled largely by French Huguenots, and pompion is an old French word for Pumpkin. A contemporary wedding record also lists this location as Ponkin. 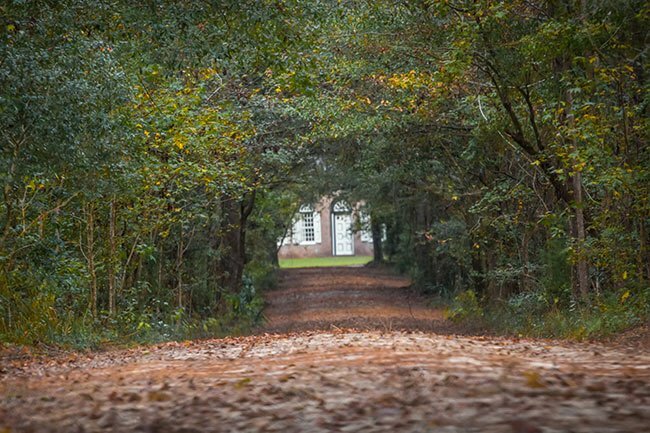 Zachariah Villepontoux, a well known and respected brick producer, had the bricks made by enslaved workers on his Parnassus Plantation in Goose Creek. Villepontoux was given £3000 to construct the outer shell of the church. His initials can be found on the exterior of the building. Once the shell was completed, master brick-mason William Axson was brought in by vestry members at the cost of £1000 to complete the structure. 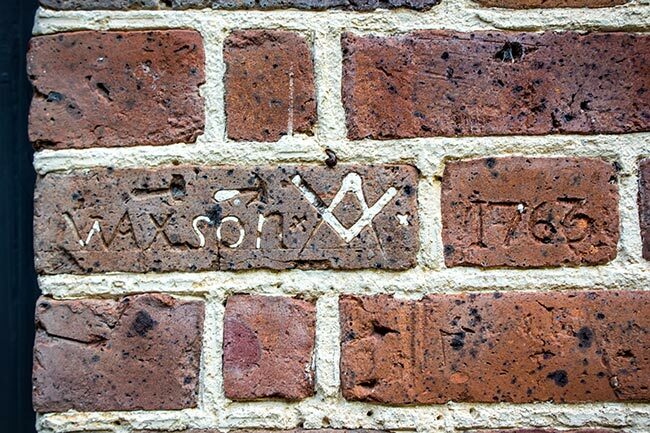 Axson also marked his initials in the brick of Pompion along with a freemason symbol. 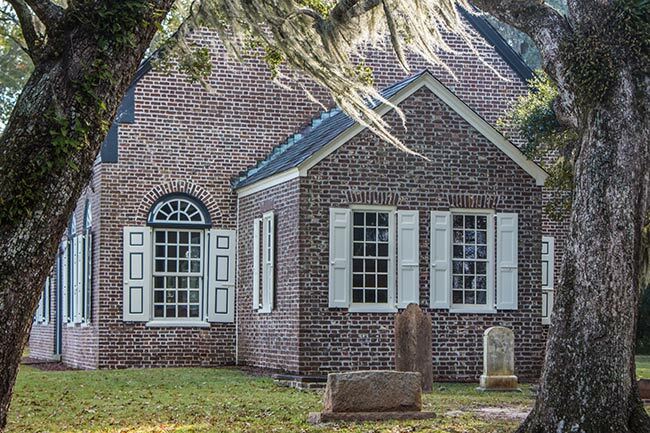 In 1767, Axson would partner with Villepontoux’s nephew to construct St. Stephen Episcopal Church in St. Stephen. 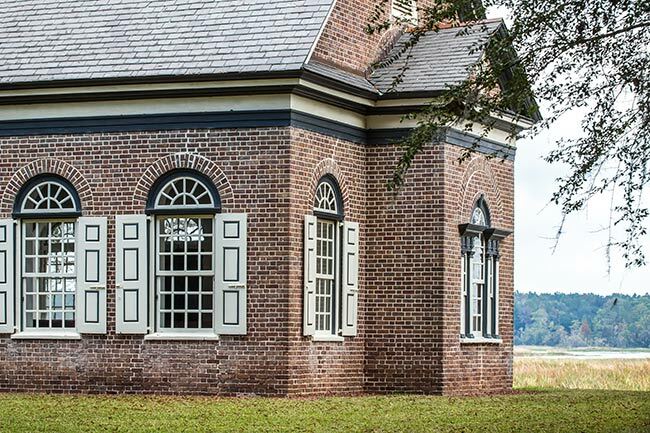 Pompion Hill Chapel, erected in 1763-1765, is a miniature Georgian masterpiece, original and unaltered. 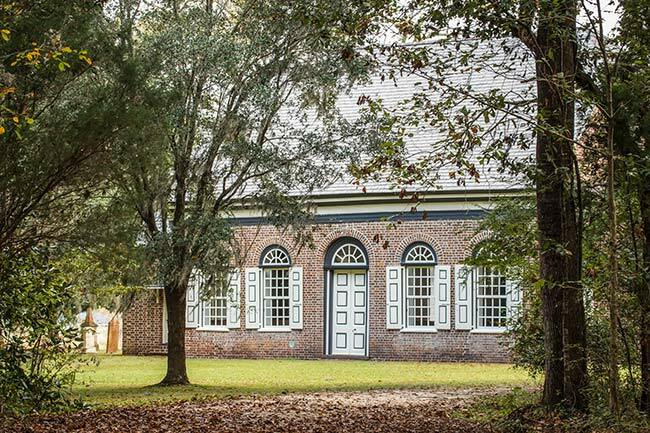 The chapel, built on a typical rectangular plan, is probably the finest and best preserved of South Carolina’s numerous small, eighteenth century country parish, brick churches. 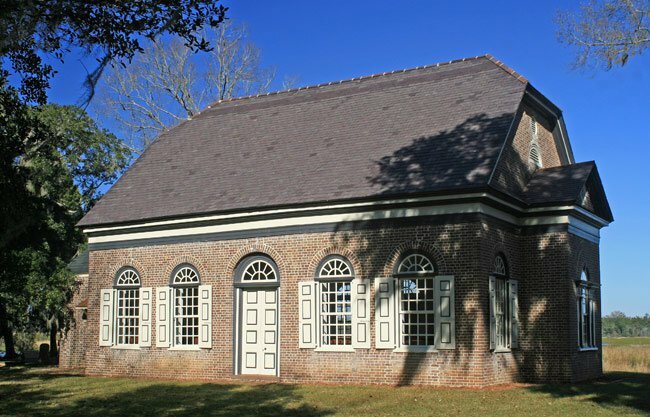 The first Anglican church outside Charleston was built in 1703 on Pompion Hill. 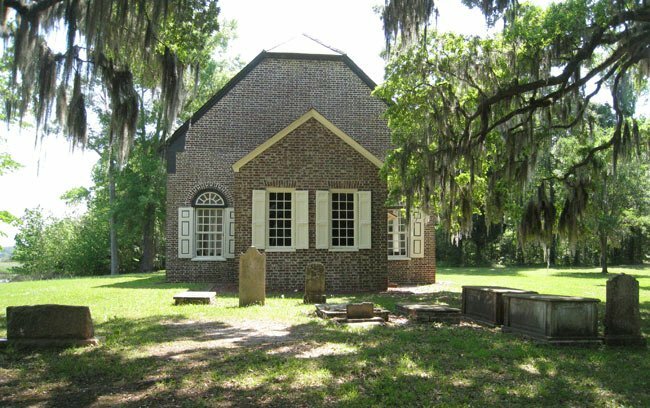 In 1706 the Church of England became the established church in South Carolina and nine parishes were laid off, of which St. Thomas’s Parish containing the 1703 wooden church, was one. 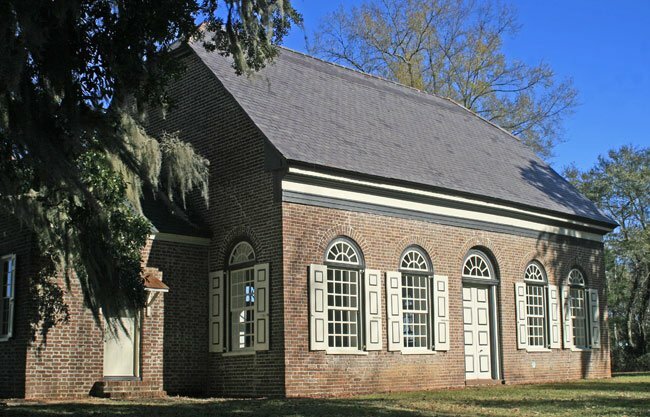 Construction on the existing church began in 1763 and was completed in 1765. 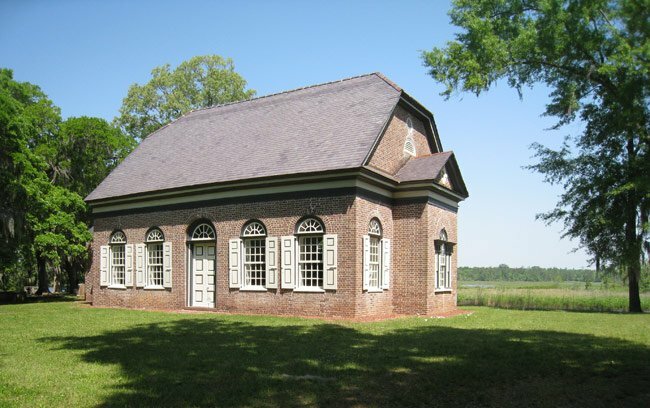 The Chapel is a one-story Georgian brick structure with a jerkinhead roof and a rectangular plan. The brick walls are laid in Flemish bond and the roof is still covered with slate. The brick was provided by Zachariah Villepontoux, a noted brick maker with kilns at his Paranassus Plantation on the Black River. The master mason was William Axson. Constructed of red cedar, the pulpit is modeled after that of St. Michael’s Church in Charleston. All interior woodwork and nearly all of the furnishings are original. The exterior of the chapel is also largely original and unaltered. 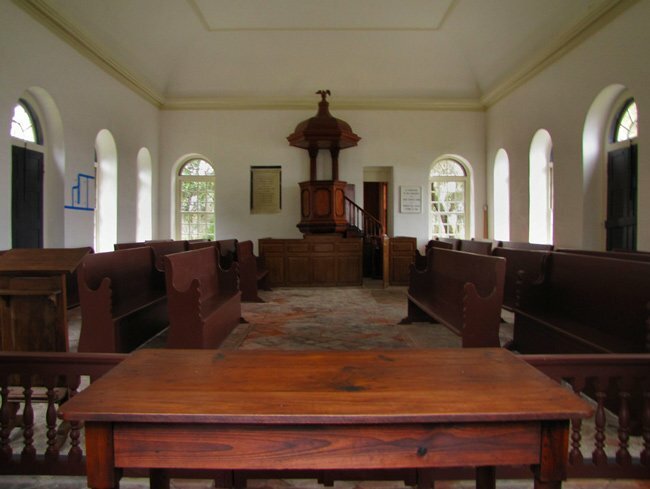 Here is a wonderful little video showing how beautiful Pompion Hill Chapel is inside and out. I noticed the below comments are from 2017. Is the site still not open to the public? Can one park and walk the grounds? Hello Jean, we have forwarded on your request and will let you know if we are able to find out any information on potential contacts. Thanks! I am a descendant of Josias DuPre and will be attending the Huguenot Church Service in Charleston In April. Is it possible to visit the Chapel? My ancestor is buried there, just not sure where. I will be coming from Nebraska and only have a few days there. Thank you! Wow! That is pretty amazing. There is indeed a photo of it when we googled Pompion Hill Chapel 1764. Located here: https://www.rootsandrecall.com/berkeley/files/2014/12/church-806-275a-2-300×200.jpg. Hope this helps you! 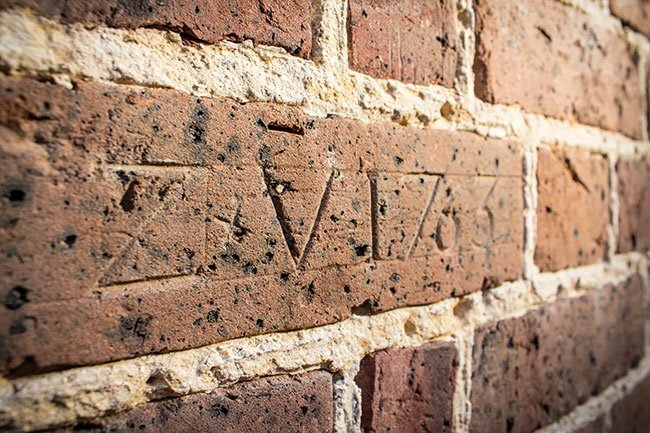 I was in contact with a staff member of the Charleston Museum a number of years ago who wrote: “There is a plaster inlaid brick on the exterior of the chapel bearing the mark “IE 1764″ which is strongly attributed to either Joshua or Jeremiah.” Are there any photographs of this brick? I am trying to authenticate Joshua Eden’s makers mark – I am the keeper of one of his (I believe) spinning wheels. We were in the river one afternoon and someone was giving a tour of this chapel. How can we get that coordinated? Wondering if there is a resource for finding burial plots or records at this location. Also, Joseph, Bill and Ann: Thank you for taking the time to post photos of the chapel. Hi, Gary. 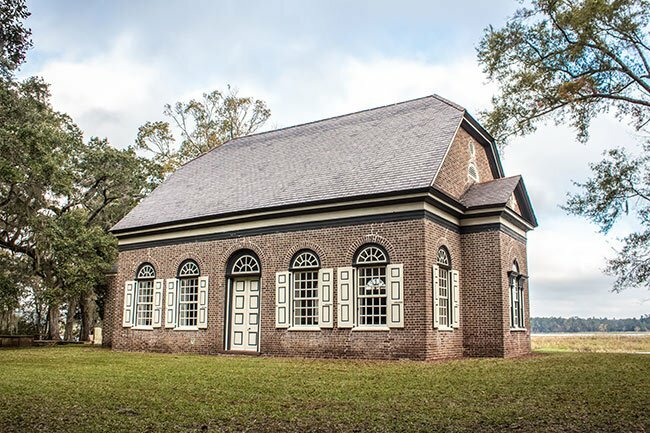 Pompion Hill Chapel is on private property, but the Preservation Society of Charleston conducts the occasional tour. Here is a link to the Preservation Society: http://www.preservationsociety.org/. I hope this helps.